The sun was shining in Charleston on Wednesday with 14 second round matches on the schedule. It was a fun day of tennis and there were some very enjoyable matches. The action keeps on coming with the last 16 up on Thursday with a few thoughts about some of the match-ups at the end of this post. 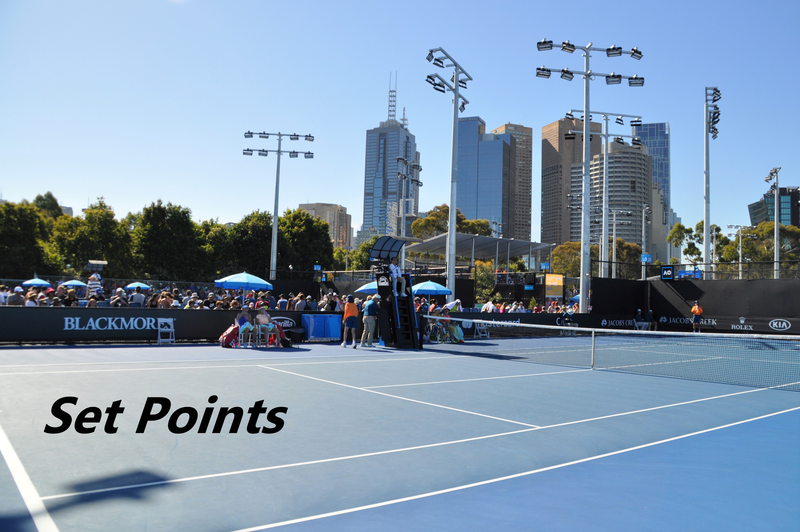 Read on for highlights from day 3 of main draw action at the 2019 Volvo Car Open. Producing one of the most befuddling scorelines of the year, Kaia Kanepi saved a match point to beat Elise Mertens, 0-6 6-0 7-5. This was an absolute rollercoaster of a match with the split bagels (!) and then plenty of twists and turns in the third set. Mertens saved a break point at *1-3. Kanepi then saved two break points at *3-4, the second of those with one the best break point saves you’re likely to see all year. Kanepi then saved a match point at *4-5 with a blistering backhand winner that barely caught the line. Kanepi won the last three games of the match with some peak ballstriking, playing patiently against Mertens’s tireless defence before swatting winners away off both wings. It was a wild match with the bagel sets, moonballs aplenty and some ridonculous rallies. I enjoyed it very much! From a set and a break, Aryna Sabalenka rallied for a much-needed win over Kateryna Kozlova, 3-6 6-3 6-3. Kozlova led 6-3 2-0 with the main difference between the pair early on being Sabalenka’s much larger unforced error count. I thought Sabalenka cleaned up her game in the final two sets and was a bit more aggressive. Dare I say she was almost passive in the first set and a half – Sabalenka was hesitant to come forward and tactically off, going for some wild shots. Kozlova is becoming a pretty sound all-rounder. A few poor misses midway through the third set ultimately cost her. Sabalenka wasn’t convincing closing out and 11 double faults during the match didn’t help her cause. I think that these types of wins mean a lot as she had to battle. Winning when not at your best is a big deal. Sabalenka will have a chance to improve in the next round against Monica Puig and I think she will need to improve if she is to advance further in this tournament. Jessica Pegula scored the best win of her career, beating the number four seed, Anastasija Sevastova, 6-4 6-2. The 25-year-old American, who needed six match points to seal the win, is actually having a great year with this being her 14th victory of 2019. Taylor Townsend scored the best win of her career, beating the number seven seed, Julia Goerges, 6-4 7-6(0). I can’t believe this is Townsend’s first top 20 win! Since winning Auckland, Goerges has posted a 5-7 W-L record. Monica Puig beat the number 13 seed, Sofia Kenin, 6-4 6-4, to win back-to-back matches at a WTA level event for the first time since Wuhan. There goes my Charleston champ 🤣. Caroline Wozniacki produced a superb performance to beat Laura Siegemund, 6-2 6-2. The match was much, much closer than the scoreline suggested – in the first set, six of the eight games went to deuce. I was impressed with Wozniacki in Miami and here too in this second round performance in Charleston. She reacted as well as anyone i’ve seen to the Siegemund drop shot on clay. Wozniacki was generally very positive in her game, hitting groundstrokes from the baseline, hitting aggressively and closing the net. I don’t think Woz gets the credit she deserves for how much she has developed her game and variety since reaching world number one for the first time. It was nice to see Francesca Schiavone in her box! It’s clear that Woz is feeling healthy right now and comfortable to be aggressive. I think she’s one to watch over the next few months. See below the point mentioned in Kanepi-Mertens above where Kaia crucially saved a break point in the third set. Great shot by Jimmie48 Photography of Belinda Bencic during her 6-0 6-3 second round win over Allie Kiick. A nice moment at the net between Jelena Ostapenko and Shelby Rogers where you could hear Ostapenko saying to Rogers “great fight”. Rogers came so close to the win and played a great match for the most part. Ostapenko came from 1-5 down in the third set and saved a match point, edging a nervy third set tiebreak with three big winners at the end. Rogers very upbeat about her first tournament back from her injury lay-off. Good piece on Aryna Sabalenka who discussed her reaction to losing to Belinda Bencic in Dubai where she missed six match points. I really hope she means it that she is feeling no pressure on clay. Aryna Sabalenka takes some tough lessons learned on the hardcourt into the clay season, where she’s ready to make her mark. Madison Keys vs. Jelena Ostapenko: Probably the match of the day and no idea which way it will go. Both scored gutsy, come-from-behind second round wins in three long sets. Ostapenko has won back-to-back matches for the first time in 2019, while Keys clearly adores this tournament. Caroline Wozniacki vs. Mihaela Buzarnescu: Thrilled to see Buzarnescu back to winning ways as she has won back-to-back matches for the first time since winning San Jose last year. I think Buz is the type of player that can cause Wozniacki problems. I would still go for Woz because I think she’s fighting fit and playing very positively. Aryna Sabalenka vs. Monica Puig: New match-up alert. A huge-hitting clash to relish. Definitely an upset alert although Sabalenka’s come-from-behind win over Kozlova should have been a boost. Danielle Collins vs. Kaia Kanepi: Ring the bells again for a new match-up. There were flashes of peak Kanepi vs. Mertens but she does have a lot of taping on her shoulder. I think this match could be a gem. Kiki Bertens vs. Maria Sakkari: Bertens and Sakkari will meet for the sixth time on the WTA tour – the matches have gone Bertens, Sakkari, Bertens, Sakkari, Bertens… Sakkari needs to win to continue the pattern but i’d definitely go with Bertens who feels like the favourite to win Charleston right now.